The square hole seen here is the rim dowel stick hole. The inner laminations of this rim are straight grained maple and the outer most lamination is walnut. The rim cap is also walnut. A banjo rim, sometimes called the pot, has several functions. It acts as a frame to stretch the head across, acts as the sound chamber, and gives us something to attach the neck to. As with all other aspects of the banjo there is a good deal of variety in rims. The main thing is that it be strong enough to hold tension on the head without a risk of warping. A good banjo rim need not be overly heavy but should act as a counter balance for the neck. If a rim is too light the neck will feel heavy in the noting hand and will have to be supported by that hand. It is better if the banjo balances itself, freeing up the noting hand for noting. The rim, in acting as an anchor for the neck must have some way to accommodate the dowel stick, this is accomplished by the rim dowel stick hole. The neck also has a dowel stick hole, so be careful not to get the two terms confused as they will often be mentioned together. The neck dowel stick hole and the rim dowel stick hole must be coordinated with each other, this takes careful planning. The tail of the rim is 180 degrees from the rim’s dowel stick hole. The tail of the rim has a special hole that accommodates a special screw that is known as the end pin screw. This screw holds the dowel to the rim at this end. Most modern open back banjos have an 11″ or 12″ diameter rim. The diameter of the rim affects several characteristics of a banjo. The size of the rim defines the size of the head. The banjo with the 12″ rim often has a bit mellower tone than the banjo with the 11″ rim. The 12″ banjo often has greater volume potential than the 11″ as well. I like both the 11″ and 12″ rims, but lean towards the 12″ as my personal favorite. The size of the rim also plays an important role in planning. The neck for a banjo with a 12″ rim is slightly shorter than the neck for an 11″ rim banjo in the case that they both use the same scale length. The diameter of the rim will also have some affect on the balance and “feel” of the banjo when it is held on one’s knee. I prefer to make a banjo rim from scratch that is 1/2″ thick or a little thicker. It looks and feels sturdier and I think the mass of the rim may create some positive tonal qualities as well. The weight of the rim is naturally related to its thickness. The weight of the rim will contribute to the balance and “feel” of the banjo as does the diameter. This “made from scratch” rim is constructed from four thin strips of wood formed and glued together. Commercially produced drum shells make a nice banjo rim. 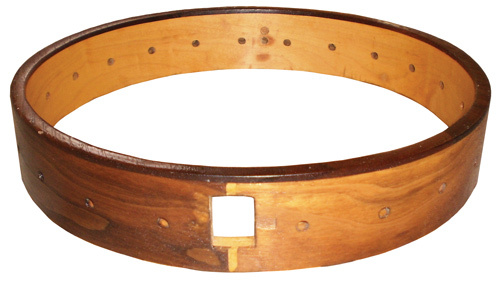 Using a drum shell for a rim reduces the amount of work involved in building a banjo significantly. It’s not a bad solution and makes for a fun instrument that can be enjoyed for many years. Many drum shells measure about 3/8″ thick. This is really a little thin and a little light for my own taste. The drum shell being light in weight can make for a banjo that feels neck heavy. The depth of a banjo rim can have significant impact on the tone of the instrument, much as the depth of a drum changes its sound. Depth contributes to the total weight of the rim also. The depth of the rim also plays an important role in the planning of a banjo.